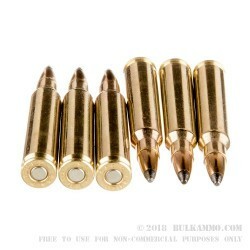 A very good hunting round with great accuracy, solid ballistic numbers, a soft point projectile and still offering a below premium price point. 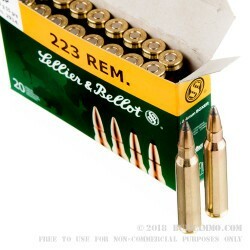 The Sellier & Bellot .223 Remington ammunition is a very solid ammunition choice or those who want a round that they can hunt, up to big game with their .223 rifle. The 55 grain soft point finds its sweet spot in the 1 in 9 and 1 in 10 twist rates and is an exceptional round for everything in the field from varmints to moderately sized hogs and deer. The quality control and reputation of S&B is top notch and for those that aren’t familiar with the company, this is a Czech based company that has been producing ammunition since 1825. They aren’t some fly-by-night company that puts together a shoddy product. 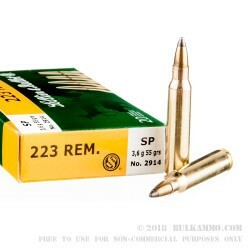 They have been a premier provider of law enforcement and military ammunition to agencies around the world for many decades and continue to deliver top tier ammunition that has been very well received in the American shooting market. 3300 feet per second muzzle velocity and 1330 ft. lbs. of energy at the muzzle makes this a potent round for the moderately sized game it was meant to go after.